Nursing major Wendy Ibanez was guessing her way through her college career, unaware of certain criteria she needed to meet in order to apply for the nursing program. She said it was by mere chance that she found out help was available via academic advisers. That somebody else was Health Professions Adviser Claire Echols, who, Ibanez said, was very knowledgeable. Freshman McKenzie Crim said her experience was just the opposite. She had been told early on that she should visit an academic adviser. Crim said her academic adviser was very helpful, even taking the time to help her select professors. “He probably spent three hours helping me,” she said. News Writing Professor Sue Hinton said before enrolling for a second semester, students should visit with a faculty adviser. “Students start, as you know, in general advising, and they’re more likely to come to their major professors, unfortunately, in their sophomore year,” she said. Hinton said that while both general advisers and students have a tendency to want to get basic courses out of the way, enrolling in major courses during freshman year gives students the chance to discover if their major is a good fit. Ibanez said general advising should refer students to faculty advisers early on — especially students who have questions about their degree fields. 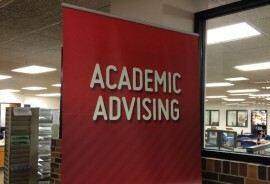 Advising Director Tammy Madden agrees that would be preferable but said, early in the semester, advisers are swamped with just trying to get students enrolled. “September and February are really the times we can sit down with [students] and do the career exploration and that discussion,” she said. Hinton said many students would benefit from getting an academic adviser right away. She said students who take their first major course during their freshman year increase their chances of advancing in that field early in their career. There are many performance and intern opportunities that require students to have basic skills first or, prerequisites, Hinton said. “As you know, we hire our newspaper staff from our News Writing class. Ibanez said she wishes she had been told about faculty advisers earlier. She said general advisers should refer students who have questions about their degree fields or want additional guidance, to faculty advisers. Madden said she hopes, in the near future, students will automatically be assigned a faculty adviser. For more information about advising, call 405-682-7535.